From Randy Alcorn’s blog at: www.epm.org , August 15, 2014, written by Eternal Perspectives Ministries employee Tami Yeager, who is also a volunteer at Voice of the Martyrs organization. The Voice of The Martyrs USA ministry office in Bartlesville, Oklahoma has a Martyrs Monument. Displayed on that monument are the names of many martyrs, each one representing a real person with a real story. I love to stand near this memorial and slowly read the names and brief descriptions. During a recent visit I found myself once again drawn to the monument. On this particular day there was one memorial stone that stood out to me. It simply read A Nigerian Woman. Unlike the others, her name had not been inscribed in the beautiful stone slab. She had been beaten to death by an angry mob before the authorities could learn her name. I wondered what she looked like, and how old she was. She was someone’s daughter. Did she have sisters and brothers? Was she married, and did she have children? These are questions I will not know the answers to on this side of eternity. I imagined what her village may have looked like and wondered what must have taken place in her life leading up to that day in 2006. I wondered how she had been prepared for that moment. Did she wake up on that fateful morning with a sense that this day would be different? Was it customary for her to share her faith with others? 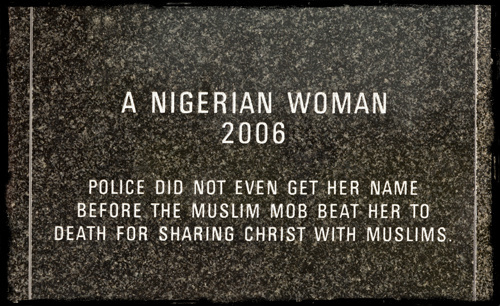 Surely she knew that sharing Christ with her Muslim neighbors could cost her. I believe she had counted the cost, and was well acquainted with the price one could pay. I imagine love was her motivator, and its weight far outweighed her fear. Did people silently slip into their homes as voices began to rise in the streets that day? Were children warned to hide in the dark, and be still? As an evil hatred raged hot amongst the mob that surrounded her, did those who believed as she did stay silent? Was her body left in the dust of the street for days as a warning to others who might have otherwise been swayed to believe as she did? Like Stephen in the book of Acts, was she looking into heaven while they beat her? Were the painful blows from many fists and feet brought to an abrupt halt as she surrendered her spirit, exhaling her last earthly breath, and simultaneously taking in her first heavenly breath? What was it like for her to open her eyes and find that she was now in the arms of the One whom she had exchanged her life for? Standing to receive her white robe, did she recognize some of those who surrounded her? Did she then hear the cheers from a great cloud of witnesses that had been ever so faint before, and now could be heard with vivid clarity? Was she overcome with indescribable joy, peace, and happiness at the sound of the King’s words, “Well done my good and faithful servant, now take your place and wait a little longer”? I wonder who among the angry mob walked away that day unable to shake what they witnessed in her. She had been faithful unto death. Were there some who closed their eyes that night unable to escape the images now playing in their minds? Were the words she spoke to them being repeated in their thoughts? Were any of those who took part in her murder later visited in dreams and visions by the One she told them about? Would some of those who hit her, kicked her, spit upon her, and cursed her later fall on their knees and cry out for forgiveness? The truth is I do not know any more about the Nigerian woman’s story then what is written in stone. I am, however, keenly aware that in many places of the world today suffering for the sake of the gospel is “normal” Christianity. The little I do know of my Nigerian sister fuels a passion in me to give her, and others like her, a voice. I look forward to the day I meet my sister. It is then that I will learn all of her story. Matthew 5:10 — Blessed are those who are persecuted because of righteousness, for theirs is the kingdom of heaven. Acts 7:55-60 — Stephen, full of the Holy Spirit, looked up to heaven and saw the glory of God, and Jesus standing at the right hand of God. 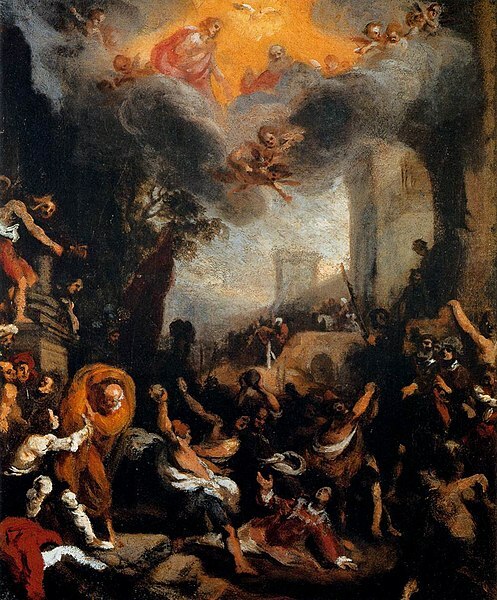 “Look,” he said, “I see heaven open and the Son of Man standing at the right hand of God.” At this they covered their ears and, yelling at the top of their voices, they all rushed at him, dragged him out of the city and began to stone him… While they were stoning him, Stephen prayed, “Lord Jesus, receive my spirit.” Then he fell on his knees and cried out, “Lord, do not hold this sin against them.” When he had said this, he fell asleep. Psalm 63:3a — O God,… Thy lovingkindness is better than life. Revelation 6:11 — Then a white robe was given to each of them. And they were told to rest a little longer until the full number of their brothers and sisters—their fellow servants of Jesus who were to be martyred—had joined them.